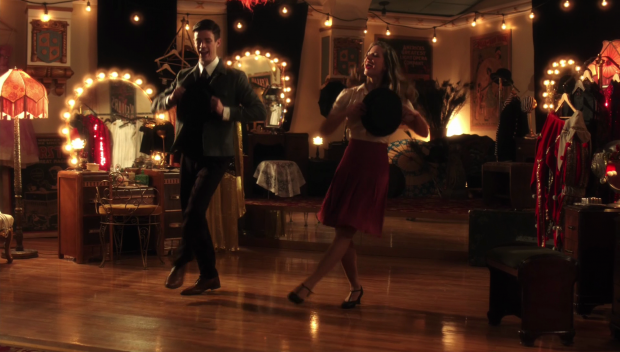 The Flash crosses over with Supergirl when Barry and Kara are put in a shared coma fantasy where life is an old timey musical. I’ll preface this by saying that this episode will definitely be a “mileage may vary” sort of episode as your enjoyment will largely depend on whether or not you like musicals. My personal opinion on musicals is that I have nothing outwardly against them but they aren’t my preferred genre. That said, I had a lot of fun with this episode as it coasts by on the novelty of the scenario. The DC Universe is so rich and varied that it’s possible to transition from unspeakably dark to laughably silly and get away with it. On TV it’s a little trickier because shows tend to have a tone that they often return to so certain outlandish concepts would never work. A musical episode would never work on Arrow for instance but the framework built around Supergirl and The Flash allows it to be something that can work. Of course this episode only exists because the shows that inhabit this shared universe have a lot of talented actors working on them who are able to sing really well. Grant Gustin and Melissa Benoist were both on Glee and I imagine the other actors featured here have some background in musical theatre or are just blessed with a pleasant singing voice. The real challenge is having an episode like this that isn’t completely disposable and I would say this episode partially succeeds in that regard. Any regular readers of my reviews of The Flash will know that I haven’t been enjoying the show this season because it has lost its sense of fun and the writers seem to have stopped caring whether the show is consistent with things like Barry’s powers. It all feels lazy to me but the loss of fun has been the biggest issue for me because I can forgive a lot if I’m enjoying the overall experience. The problem is that I haven’t been so my levels of frustration have been high. One thing I can say about this episode is that it’s a lot of fun. Barry and Kara are a really endearing pair to watch interact and the old timey musical setting makes for a nice change of pace. It was a really nice touch to have Kara and Barry aware of the fact that they are in a musical because it allowed them to comment on the situation as well as remaining the characters we know rather than characters within a musical who are played by Grant Gustin and Melissa Benoist. I was glad to see a more endearing side of Barry than has become normal this season. He’s normally such a downer but being in a musical seemed to bring out the best in him. After the initial confusion he allowed himself to enjoy the situation for what it was and make the most of being able to spend time with Kara who reacts in much the same way. The setup for the musical worked for the most part. It’s mentioned that this is a shared fantasy created by Barry and Kara which accounts for everything we see here. Barry is established as being someone who loves musicals as is Kara who also really enjoys Wizard of Oz which accounts for familiar characters showing up in alternate guises. She may not know who Malcolm Merlyn is but Barry does so it makes sense that the alternate Malcolm would come from Barry. There is a story crafted around this involving forbidden love and warring gangs. It’s amusing that the representations of Iris and Mon’El in this fantasy are in love with each other as it has a personal connection to Barry and Kara. The reaction from both of them when they find this out is priceless but their commitment to going along with it is admirable. There are other nice touches such as Joe and Martin being a couple who serve as Iris’ Dads. Again, the reaction to that from Barry and Joe is well played. The plot itself doesn’t really matter because it is completely inconsequential. 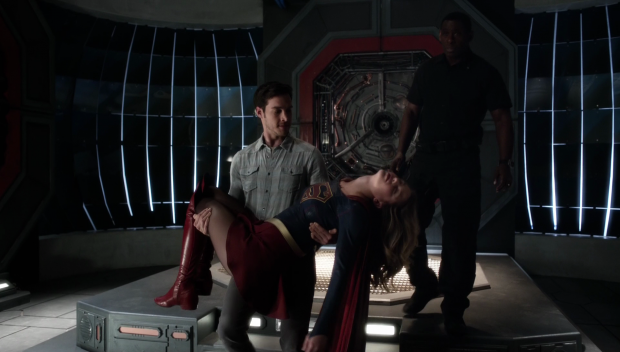 There are stakes attached to it as Barry and Kara can both be killed in the fantasy which would result in their death in the real world but the details are mostly window dressing. Fun window dressing but disposable nonetheless. It does prove to be an important experience for Barry and Kara because it highlights the issues they are both having in their failed relationships. I imagine those who didn’t watch the most recent episode of Supergirl might be a bit lost here but accepting that Mon’El lied and Kara dumped him because of that is probably enough to go on. Kara is able to realise that Mon’El lying to her could be understood because he feared the reaction that he got. It was all out of fear and that fear turned out to be justified. Kara’s lesson is about seeing things from Mon’El’s point of view. Barry’s realisation isn’t as strong but basically amounts to learning the lesson that love is something that he should pursue no matter how dangerous it is which makes dumping Iris to protect her a mistake in his eyes. Both revelations are somewhat obvious but it ties in with musical theme since things are so much more open and clear in musicals. This is something they both observe so it makes sense that the lessons they both learn are really obvious. The way the musical was resolved was fairly clunky. It had been established that they would wake up once they resolved the plot of the musical but this changes when it takes the intervention of Iris and Mon’El forcing themselves into the fantasy to save Barry and Kara as they lay dying. It would have been better if the lessons learned by each of them tied into a showstopping number that ended the musical. The gang war along with their near death was clumsy and didn’t fit with what had been previously established. I was also disappointed in the lack of musical numbers. What we got was great with my personal highlight being the “Super Friend” song as well as Melissa Benoist’s incredible rendition of “Moon River”. The other numbers were good as well but there were several points where the most logical next step in the plot would have been for Barry and/or Kara to get the point across through song. It feels like the writers didn’t fully commit to the concept when they should have. Having the final musical number happen after the musical part of the episode had been resolved was an interesting idea. It did tie into Nora Allen’s words about everything in life being better in song so it made sense for Barry to express his feelings through song to Iris. I like that it resolved the needless angst created last week and got rid of a plot that I thought was going to fester for weeks. That said I don’t think this really worked but that might largely be because I didn’t enjoy the song. Outside of the fantasy there was a welcome team-up between members of Team Flash and Team Supergirl. It was great to see Cisco and Wally working with J’Onn and handling the heroics. It was a short sequence but made really good use of the abilities of those involved and did an effective job of working together. I wish we could see more creative sequences like this as the show has been somewhat lacking in delivering them of late. It also had the added benefit of getting Wally back in the game in a really big way and allowed him to face his fears. This is another thing I expected to linger for weeks that I’m glad to see resolved even if it was done very quickly. Hopefully this puts the show in a better position in the coming episode now that some of the baggage seems to have been shed. The Music Meister (Darren Criss) was a good enough villain though his motivations were really vague. Apparently his mission was to shake Kara and Barry out of their collective funks but it’s not clear whether he’s a metahuman, alien or something else. I’m also confused as to why he gained Kara and Barry’s powers and what he was doing with them other than running around. Darren Criss was charismatic in the role and the character was fun but some explanation would have been nice. It’s also disappointing that he barely participated in the musical numbers. I would also have liked to see Tom Cavanagh taking on a 40s gangster persona. A welcome change of pace that is a lot of fun to watch but enjoyment will highly depend on whether you like musicals or not. Kara and Barry are always a delight to watch together and they are both very talented singers. It was a good decision to have them break the fourth wall and comment on being in a musical as it allowed the characters to be themselves rather than different characters played by the same actors. It’s a shame there weren’t more musical numbers as Barry and Kara only sing together once. Seeing the other versions of characters like Joe, Martin Stein and Malcolm Merlyn was a nice touch as well and the episode gave a good excuse for the actors turning up in different roles. I also like how it managed to fit in Kara and Barry learning important lessons about the main relationships in their lives. It was just a lot of fun to watch but I wish the musical aspect of the episode had been taken full advantage of. I loved the team-up between Team Flash and Team Supergirl. The characters involved all worked together and the sequence was really well put together. Music Meister as a villain could have been better developed as his motivations were confusing but Darren Criss did a really good job in the role and it’s a shame that he was barely involved in the musical numbers. 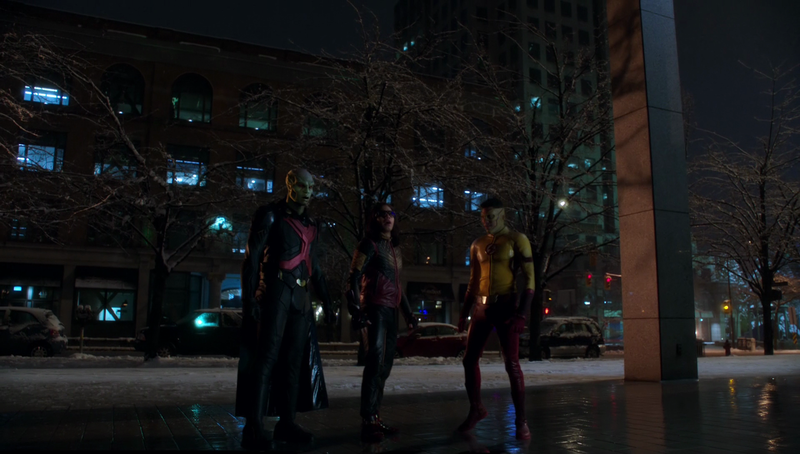 I really disagree with your rating, I like musicals but this episode is a mostly boring one, I liked two of the musical numbers (the two with John Barrowman) and the J´onn/Vibe/Kid Flash team up, but the script is disapointing in almost every aspect. I didn’t find it boring myself, on the contrary I found a lot of it to be fun though I definitely feel like this episode isn’t for everyone and there definitely could have been more musical number. I’m just glad that a Flash episode is actually fun for once as I have not been enjoying this season.